Classically, bread in France is made from only four ingredients: flour, yeast, salt and water. The average person in France throws away 30% of the bread they buy, because it is “yesterday’s” bread. Bakeries in France bin sacksful of baguettes that didn’t sell that day. The average store in France discards around 100 baguettes a day, as their customers will only eat bread baked that day — many customers will even reject bread more than a few hours old. 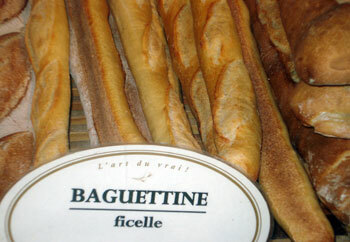 See the entries on various types of French Breads for detailed information about each type of French Bread. Brodier, Joy. Smile and say oui to yesterday’s French stick. London: Daily Telegraph. 11 December 2009. Sage, Adamn. Gontran Cherrier: France’s hottest baker. London: The Times. 11 March 2010.